The Wyverns improved to 6-5 on the season and snapped a five-game losing skid with the win. 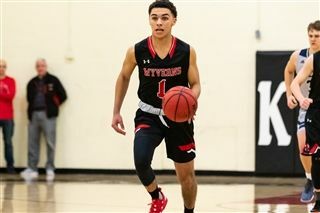 Kingswood Oxford, which started the season with a five-game winning streak, welcomed starting point guard Sean James ‘19 back to the lineup and a season-high 10 players scored for the Wyverns, including Mike DeMio 21, Mike Aronson ‘19 and Jaden Lovelace ‘20. Bray ‘19 scored 21 points in the first half to help Kingswood Oxford open up a lead and he finished with a game-high 26. “It was a great overall team effort where everyone on the team had a chance to contribute valuable minutes,” Kingswood Oxford coach Brad Seaman said. The Wyverns have 12 games left in the regular season and will try and start a win streak on Friday night when they host Westminster (2-8). The Martlets have posted victories over Pomfret, 52-51, on Dec. 15 in the KIT and at Marianapolis Prep, 47-46, last Saturday.